Happy Wednesday, everyone!! This gorgeous, soft powdery blue is one of my favorite colors to wear this summer which is why I’m super excited that the Serene Blue Bell Sleeve Dress from my clothing line is re-launching today!!! (I wore it to church on Sunday in this post). This dress is one of our best-sellers and I have a feeling it won’t last long! Do you guys love this shade of blue, too? What’s your favorite color to wear this season?! Totally love this shade of blue and that dress is stunning!! That’s a lovely dress. Makes a beautiful silhouette. this dress is so gorgeous!!! Such a pretty dress and loving that pink wall! You’re looking classy in this feminine outfit! Love your dress! Such a gorgeous soft color! I’m loving blue lately too!! Your bell sleeve dress is beautiful! I love that dress that you’re wearing from your line! Blue is my favorite color (and the majority of my wardrobe)! So many cute pieces! I love the color of that bell sleeved dress! It is so gorgeous! When will you start shipping to Europe Rachel? The customers can pay the shipping cost. Absolutely lovely … so elegant and what a great color!!! Such a beautiful dress! Love the color! Such a beautiful color! I love the soft blue hue! Such a lovely color! Obsessed! Such a feminine and delicate color, it looks so classy!! Such a gorgeous shade of blue! Love #8 for 4th of July! 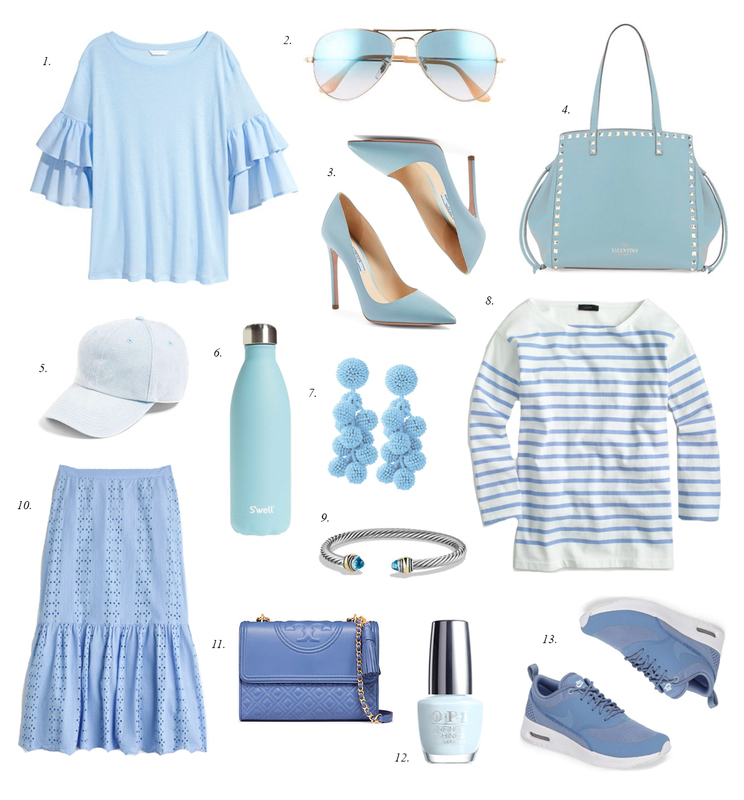 I love the powdery blue color for spring! I’m also loving pales yellows and oranges as well! This dress looks beautiful on you! this is my all time favorite color. I own the blue top from H&M and love it! I received several complements are questions about it when I wore it to church last week. Loving this color for the warmer weather! Blue is one of my favorite colors. I love all shades from light to dark, this one is absolutely perfect for the summer! The top & sunnies are my favorite. Same!! Thanks for stopping by, Krystal! I’m loving the color of that dress! It is beautiful! Hi Rach your hair is so beautiful do you dye it? Also could you do a post how to wear denim jackets in the summer. Thank you so much! Hi Christi! I do a shine on it every once in a while!! And thanks for the suggestion :) I love that idea! I love blue! I always gravitate towards it above all other colours and this guide of the muted blues is so lovely. I love this dress! I ordered it and it came last Friday! It’s so beautiful and flattering! hey rach, do u think you will be doing a rerun of this dress?…..ABSOLUTELY beautiful…..thanks in advance!